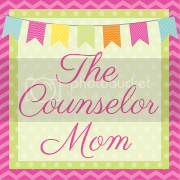 The Counselor Mom: Pillow Fight! Last night I got to use of my oldest counseling tricks on my toddler, and was so excited to finally try it out! It's a technique that I have used so much with children, that I can't even remember where I learned about it, but it's super simple. When children get mad, they hit, so redirect them to hit a pillow. Pillow time! Here's how it went down: It was close to bed time and my toddler was approaching meltdown mode pretty quickly. I was holding our baby on the sofa and facing away from my toddler, while my husband was playing with our toddler on the floor, when all of a sudden, I looked over towards her and she was about to hit her daddy. I have no idea what started it, but I have never seen her try to hit anyone before! So I quickly set a limit, "Luna, people are NOT for hitting, if you want to hit something, you can hit this pillow" and she got all bright eyed, ran over to the pillow hit it! Then I encouraged her to hit the sofa too and she did! And that was enough for her to calm down, walk away and go play with something else. I then told her again after she was calm that it is never okay to hit people or animals, or to hit toys because they can break. That if she wants to hit something, she can always hit or kick a pillow (or something soft like a sofa or stuffed animal). Simple huh? Easy enough until they can start using their words more to express themselves. I used to work as a children's counselor at a couple of domestic violence agencies, and teaching kids to redirect their anger onto something else was a huge lesson we covered each week. Since it became old habit to me to teach it over and over again, I was just SO happy and amazed that I got to use it and that it worked! You should have seen my husband's face when he saw it too. Children get all of these feelings inside of them and it can be overwhelming for them and they don't know how to handle it. They are learning what happy feels like, anger, and sadness and it's a lot all at once. And for a lot of children, like my daughter, she has never seen her parents hit anything before and it's like this innate reaction they have that when they get mad, to hit. It will definitely take children a few times of learning to understand that hitting, biting, slapping, etc are not okay. But when they get all of these feelings of anger, we need to provide an acceptable outlet for them to release them and hitting a soft object really works well. Redirecting is key. Because when the time comes when we are not there (at school, or a playdate, etc. ), we want our kids to know what to do when they get upset. Another technique I use sometimes is to redirect kids to draw their anger or frustrations with crayons or markers. Such as, "here, show me had mad you are!" and hand them a crayon and paper right there in the middle of their tantrum. They will go to town scribbling!